The “Cross” has so much power when you truly understand what it represents. 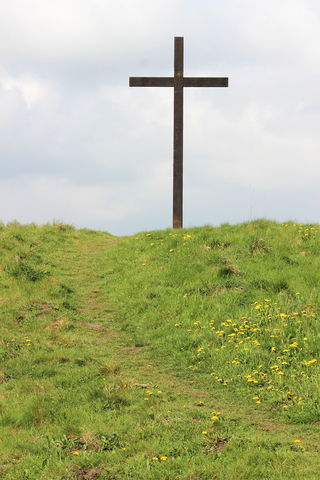 Are you willing to let the power of the “Cross” change your life? The cross becomes powerful as you learn that Christ, a perfect human being died on it for us. 1 Peter 1:18, “Christ died for sins once for all, the righteous and unrighteous, to bring you to God.” The “Cross” is the bridge to salvation and relationship to God. This is amazing that Jesus took the place for us on that cross and bore our sins to those who believe and don’t believe. This kind of love is overwhelming to think about that Jesus took on our sin, past, present, and future and died physically and spiritually for us! In the Bible it says, “God made him who had no sin to be sin for us, so that in him we might become righteousness of God” (2nd Corinthians 2:21) We are all held accountable to our sin and Christ had to die on the “Cross” to be held accountable for ALL sin. Now I can’t fathom that He was punished and beaten for you and me to take the penalty of our sin as though He committed them. This blows my mind how much He loves us, and what the “Cross” represents. This Easter I don’t want to miss the importance of the “Cross.” The “Cross” is a reminder of the sacrifice our Savior gave to each of us over two thousand years ago. We are called to repentance and to a right relationship with Him when we come to the “Cross” because of the shedding of blood from the perfect, spotless Lamb of God. So by the power of the “Cross” we have eternal life and relationship with our Savior. To Him we give all the glory and praise for what He bore on the cross for us! The great news is that it doesn’t stop at the cross, but God raised Him from the dead in order for us to be freed from the curse of sin. Sin has no power over us and the power only comes from our Heavenly Father! This Easter, don’t forget the power of the “Cross” and the one that scarified so that we can have eternal life!